Three gators will charm everyone as they take turns chomping with every step! A multi-faceted wooden toy that encourages walking and discovery. Graphic details feature cattails on the handle supports, fish on the wheels and spinning butterfly and ladybug beads. This incredible toy encourages gross AND fine motor skills, while developing hand-eye coordination. Brightly painted with non-toxic paint. 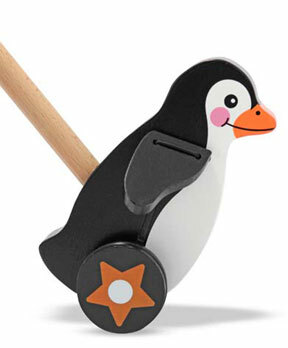 Lead the march of the penguins with this charming wooden bird. It's fun to listen to its wings flap while its wheels spin around, forward or backward. With a large wooden knob for easy grasping, this is a wonderful first push toy to accompany those first steps! Brightly painted with non-toxic paint. 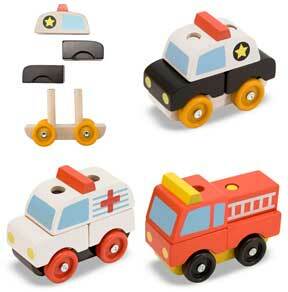 Hear the sounds of six favorite vehicles when the two wooden cubes are properly placed in the wooden tray! Fire engine and steam train are among the featured vehicles in this match and listen activity. Find the halves that match and hear six different, realistic sounds. Develops visual perception and fine motor skills. Everyone is attracted to these magnetic animals! Twenty favorite wild and domesticated animals in a compact wooden case are waiting to play! 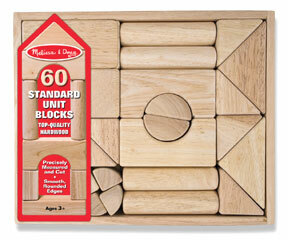 Sixty natural finished, smooth-sanded hardwood blocks are packaged in a handsome, wooden storage crate for easy storage. Ideal for building and introducing the relation of part to whole. Great value!